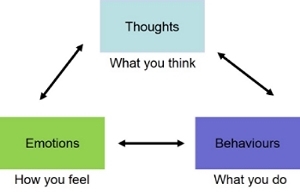 Cognitive Behavioural Therapy (CBT) emphasizes the inter-relationships between our thoughts, behaviours, and feelings (both emotions and physical sensations). More specifically, CBT assumes that our thoughts, behaviour, and feelings mutually influence each other. CBT also assumes that how we interpret or evaluate situations in daily life can influence how we feel and behave. For instance, if a student is faced with a math test next week and thinks, "I have no time to study, I'm going to fail," there is a good chance that he or she would feel anxious, and have a hard time focusing on studying or avoid it altogether. Alternatively, if he or she thinks, "I have little time to study, how do I make the most of what little time I have?," she still might feel tense and nervous, but she will likely experience better concentration and better quality study time. The beauty of the CBT approach is that when we become aware of how our thoughts, actions and feelings fit together, we introduce opportunity: to either carry on as usual with our reactions or make a conscious choice and shift our reactions. Once we decide to modify any one of these three components, we can create change in the other components. In a nutshell, CBT focuses on helping people identify and change unhelpful thoughts and behaviors, which can trigger and maintain anxiety, depression, insomnia, and stress, to improve quality of life. It is also an evidence-based approach, meaning that there are numerous studies that support its effectiveness in the treatment of anxiety, depression, stress, insomnia, and health-related concerns (e.g., chronic pain). 1. CBT can provide a new or different way of understanding problems, as well as emotional or behavioural reactions. 2. CBT can help clients develop new coping skills to address their problems. 3. CBT homework exercises are an essential part of therapy. 4. CBT relies on active collaboration between the client and therapist. 5. CBT aims to help the client become his or her own therapist. 6. CBT focuses on the present. An Examined Life During the Golden Years - Therapy-seeking Seniors.